White paint and wood grain have long been the most popular finishes for kitchen shelves and cabinetry. 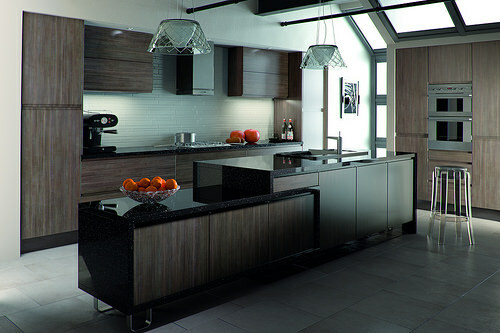 Dark kitchen cabinets have moved to the forefront of popular home remodeling projects in Queens, Brooklyn, and Manhattan. In a time when natural lighting and clean style are appreciated, painting kitchen furniture black or staining it a deep espresso color may seem counter-intuitive. In truth, this look adds an unexpected level of style to the most popular room in the house. It provides an unobtrusive backdrop for any other color or decorating scheme. 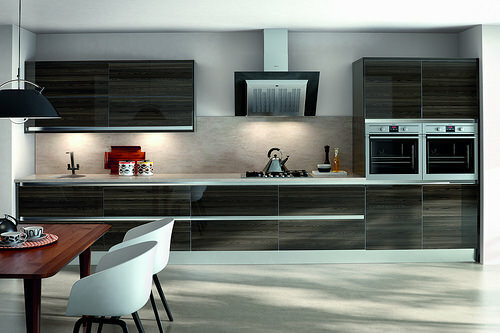 Black, dark brown or gray cabinetry suits any style of home decor. 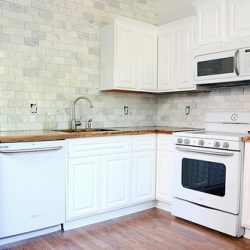 Consider some of the following ideas before you make the decision about what type of cabinets to install in your kitchen. Matte black paint or deep brown stain on smooth-faced cabinet doors and drawers can be combined with brushed nickel or antiqued bronze. This provides a traditional kitchen look. Pair them with marble counter tops and tile back splashes with just a few artistic accents to round out the style. Opt for warm black paint rubbed off to give an antique feel. Go with a very dark stain on well-grained wood. Country style kitchens should have butcher-block counters, matte tiles or hammered tin panels for back splashes. They should also have accents and plenty of antique-style decorator pieces. Think shine and sleek shapes for a modern kitchen. Glossy black paint looks wonderful with bright silver drawer pulls and fixtures. Consider bold geometric tiles for a backsplash. Consider just one or two vibrant colors for accents. Modern kitchen style can lean toward minimalism with clean lines and no accessories. Go for funky modern art style with splashes of color and odd angles. Choose industrial chic with cement counters and heaving iron fixtures. Black kitchen built-in cabinetry provides a great backdrop for an eclectic and whimsical style. 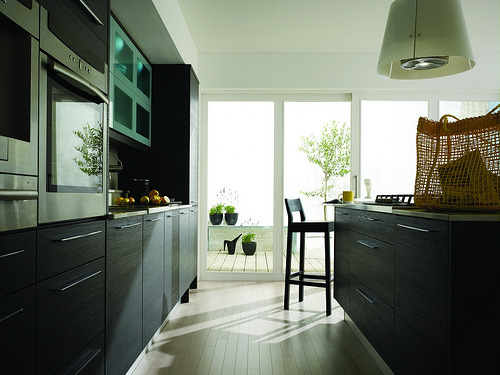 Artsy kitchens frequently have a riotous mix of colors and materials. This can get overwhelming and end up looking messy instead of creative. Starting with black, charcoal gray or dark brown stain on the cabinets helps to create a cohesive look. This look is bold enough to stand up to art glass bowls, embroidered ethnic tablecloths and unique craft pieces. Homeowners prefer open floor plans, large doorways or pass through wall cut-outs to completely closed-in rooms these days. The kitchen is visible from the living room, dining room and possibly the front entryway. It is important to decorate it as attractively as any other living space. Dark kitchen cabinets can look more like fine furniture if the rest of the house is decorated with stained or painted wood or metal. They can also fade into the background so they are not as noticeable as more interesting pieces and decorations. A solid wall of black or deep brown built-in cabinets and shelves will appear to be a solid wall in the distance. The light coming into the kitchen doesn’t have to highlight the attractive table. It can highlight light fixtures or decorator accents. 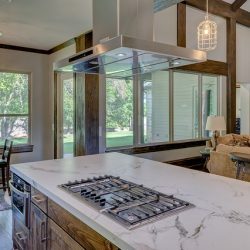 Whether your preferred aesthetic is traditional, elegant, modern or whimsical, black, charcoal gray or espresso-stained kitchen cabinets add true style to the room. Depending on the positioning and the floor plan of the house, dark kitchen cabinets can become a bold statement. They can help storage solutions fade into the background. This allows more eye-catching decorations take center stage.